Donna Brook’s The Journey of English states that the English language contains over a billion words, more than any other language, although we commonly use only about 200,000 of them. Judging from most conversations I hear, we use far fewer than that and I couldn’t begin to quantify how many of those 200,000 I may have encountered this year. Etymology is endlessly fascinating to me and this simple book is a good introduction to the evolution of English from the steppes of Siberia to the fast-food outlets in Guatemala City. It’s interesting to note that English is only about 5,000 years old–and most of that time the language existed in forms unrecognizable to us today. Chinese is approximately 5,000 years old as well but China’s isolation allowed Mandarin to develop in a much more homogenous way. English is a ragtag vagabond, lurching from central Europe to the British Isles and picking up Latin, Greek, Anglo-Saxon, Celtic and French coloring through wars and migrations, raids and intermarrying, from Celtic stronghold to Roman Empire to Saxon and Angle conquests. Tracking the words and how they appeared where they did is better brain candy than a crossword puzzle. Old English gave us the days of the week and the words eat and sleep, as well as the great legends that are the basis for many of our defining stories. The imposition of Latinate Christianity gave us angel, purple, silk and school. The Normans handed off French influence in the guise of parliament, liberty, crown, treaty and tax. The Renaissance with its recovered classics infused English with more Latin and some Greek–most English reflects those two languages although the words we use for the lion’s share of our communication, the plainspoken short serviceable words, are from the Old English. I’m familiar with David Shannon’s hilarious, evil “David” books. No David! is the first of those and they star a bad little boy whose exuberance keeps him in hot water and his mother on repeat admonishing “No!” It’s so easy to see how this kid goes off the rails every time he moves that it is perfectly safe to read and enjoy the books with a kid–David is such a mess that even children can laugh at the trouble he gets himself into. So, I was curious to read a different sort of Shannon book, a collaboration between David Shannon, artist, and his brother Mark, writer, on one of King Arthur’s tales. 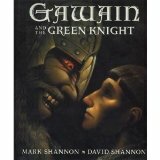 Gawain and the Green Knight is for a slightly older but still unsophisticated crowd. The story of Gawain, the youngest of the Knights of the Round Table–and something of a kid brother–simplifies the rich world of Celtic myth and legend into a one-note quest that proves steadfastness and courage. The illustrations are rich but rather dark. I liked the touch of ending a white text page with a small woven tapestry (painted) that depicts another visual element of the words on that page. Gawain is hesitant and tongue-tied until he impulsively takes the challenge of a mysterious Green Knight who appears in the midst of Arthur’s warriors. The knight is enormous and wagers that a man brave enough to strike him with an ax will not prevail. Being knights, only honor is at stake–the challenge is just yuletide sport. Being males, pointless violent stunts are irresistible, so the wager is on. Naturally, there is a catch. Gawain chops off the knight’s head and the knight picks it up and booms out the penalty. Gawain will have to travel to his Green Chapel and allow the knight his counter blow. Complications, in the form of a fair lady who embroiders Gawain a protective sash and a magical couple and castle where Gawain spends the night before riding to the Green Chapel, allow Gawain to show his true mettle. It’s very high-minded with almost no blood and the good guys triumph in the end. Arthurian stories are marvelous and I would never hesitate to put one in front of a kid but I don’t know how much this one would captivate. I found it a little flat–possibly a chivalrous small boy would think it was exciting and cool. Not a hapless mini-disaster-area like David Shannon’s anti-hero David, though. Put Gawain and the Green Knight in front of him and he’d probably spill purple grape juice all over it. One of the most empowering gifts you can give to a child is the skill of paying attention, of noticing. A child’s context explodes when she notices the life around her deeply. Simple enjoyment of very small and enormously significant things multiplies exponentially. People who are aware are smarter, cope better, appreciate what is real and live richer lives. That’s why the paint box is better when it contains many hues, not just primary and secondary colors. Several shades of green, for instance. 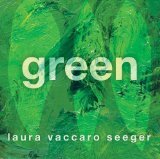 Laura Vaccaro Seeger’s beautiful picture book Green is spare on language but overflowing with so many permutations of green that you will be fascinated and return to examine it again and again. Green contains 33 words (I counted) but you could spend hours lost in them, exploring the circumstances in each gorgeous picture that cause the green, that alter the shade, that contribute to the intensity. Green is characterized, embodied in a slow inch worm, incongruous on a zebra and wholly absent in the landscape around a snowman. Observation leads to discussion–which improves vocabulary, understanding of basic science, mastery of abstract concepts like fierce and faded, acknowledgement of complexity–how can green be khaki, which is almost brown, and lime, which is very yellow? There is a whole world in green–and in this book. Clever cut-outs add to the magic by revealing butterflies and moths, inchworms, a nightlight, a flower, and even adjectives made of reeds and splotches that, isolated in the cutout, form words. Give a kid something brilliant to contemplate and you honor the brilliance that is in that child. Green does that. It will wake up your half-dead imagination, too. I wish all books for children were this amazing and rewarding. When I saw this book in the children’s section of the St. Agnes library, I thought the title said, The Bipolar Seed by Dr. Seuss. Life can be pretty bizarre in Manhattan but the idea of a picture book for kids about bipolar seeds seemed waaay over the top. Until I looked closer and read, The Bippolo Seed and Other Lost Stories. Oh. Not nearly so interesting. But believable. So I checked it out. It’s a very sweet book. A Seuss scholar, Dr. Charles D. Cohen, assembled this collection of early Seuss stories that were published in magazines and pretty much lost. Once he had tracked down seven tales, he restored the art and published them as a collection so they would be preserved–and read again. They are charming. “The Bippolo Seed” tells what happens when a duck finds a magic wishing seed and begins by asking for a week’s worth of duck food but is then persuaded to ask for the moon and about 9,000 other things he doesn’t need. Greedy duck gets his comeuppance. “The Rabbit, the Bear and the Zinniga-Zanniga” shows how cleverness can outsmart brawn–and escape being dinner. “Steak for Supper” introduces a wacky bestiary of imaginary creatures only Seuss could have created. That signature rhyme lets you sing-song your way through a read-aloud and the sum of the parts adds up to wild make-believe that seems perfectly real. “Gustav the Goldfish” is an exploding disaster contained by the freaked out kid who caused it in the first place. “The Great Henry McBride” extols the virtues of dreaming large. I like the common sense and the good cheer of Dr. Seuss. He is as matter-of-fact and off-the-rails as the children he writes for. This rescued collection is a small gift of a little extra Seuss to dip into after your 357th reading of The Cat in the Hat and Horton Hears a Who!